Rainbow on a plate with a sizzle to match - what more could you ask for!? Using our new Sweet & Smoky Hot Thai Sriracha Chilli Seasoning, Cape Herb continues to challenge the flavour norms. This is a super easy, toss together meal that doesnt compromise on any of the good stuff...enjoy! Preheat your oven to 200 ºC. Drizzle the vegetables with olive oil and honey and dust generously with the Cape Herb & Spice Sriracha Chilli Seasoning . Toss through to ensure everything is coated. Line a baking tray with baking paper (this makes cleaning up easier) and tumble the vegetables on. Roast until the vegetables are cooked through and starting to caramelize – this should take around 30 to 40 minutes depending on how small the vegetables are. Mix the coriander with the yoghurt to create your cooling yoghurt dressing. 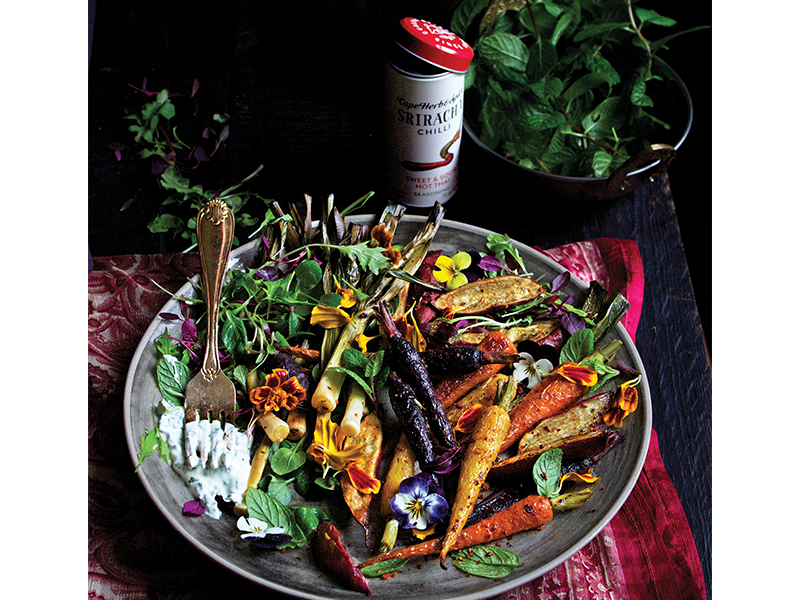 Tumble the veggies onto a platter along with peppery watercress, fresh mint and some micro herbs and edible flowers. Give it a final light dusting of the Sriracha seasoning and drizzle generously with the yoghurt dressing. This recipe serves 2 as a vegetarian main or 4 as an accompaniment.